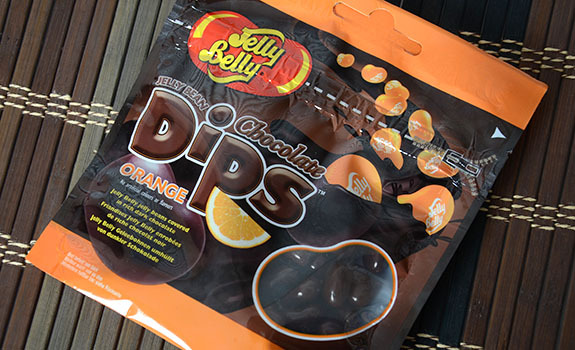 A bag of Jelly Belly Chocolate Dips, in orange flavour. I like Jelly Belly jelly beans enough to be able to pick my way around the nasty flavours in a bowl of assorted beans. Popcorn? Yuck. Same with just about all the “creamy” ones. And yet these new Dips Jelly Belly candies are new to me. NEAROF! was gifted a bag from America a few months back, but they’ve now also landed in Canadian shops. Hooray! So let’s get tasting, shall we? I hear there are multiple flavours out there, but the orange ones were the ones I found at my Co-op store, so that’s what I’m trying first. The Look: Nice little bag with a resealable top. Good for sneaking a few beans without feeling like you have to finish the bag. The jelly beans look like chocolate-covered raisins. It’s as though they’ve been deliberately formed to be misshapen and imperfect looking, with divots and a crease in the middle the chocolate doesn’t completely coat. By comparison, Jelly Belly beans all look identical in their perfection. An interesting choice that must have been deliberate. The Taste: First impression? Orangey and chewy, with the sugary candy shell replaced by chocolate. Second impression? Big Turk bar. Not that it tastes like Big Turk exactly. But the chocolate combined with the chewy jelly centre makes me think of Big Turk, even though these are superior on many levels. The chocolate is fine, though I think a creamier milk chocolate might have been a better choice. The orange flavour tastes natural and juicy, but it’s also a little bit like those Sunkist fruit snacks I used to get in my lunchbox as a kid. The flavour lingers and takes a long time to dissipate. 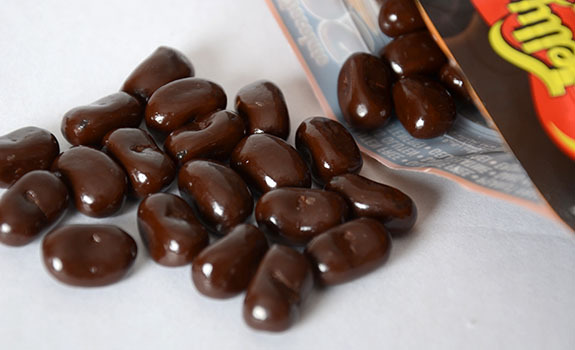 Little chocolate-covered Jelly Belly candies. They’re perfectly imperfect. Cost: $2.99 for an 80 gram bag at Calgary Co-op. Nutrition? : Per 35 pieces (40 grams): 150 calories, 4 grams of fat, 30 mg of sodium, 1 gram of fibre, 0.5 grams of protein. Melty? : If you put these on the palm rest of a warmish MacBook Pro, they’ll start to melt without much delay. Lesson learned. The verdict: Strangely addictive and quite satisfying. I’m sold.